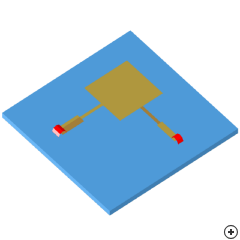 Image of the Dual microstrip-edge-fed circularly polarised rectangular patch. The rectangular patch antenna is the most commonly used microstrip antenna. It is usually operated near resonance to obtain a real-valued input impedance. The fringing fields act to extend the effective length of the patch, thus, the length of the half-wave patch is usually less than a half wavelength in the dielectric medium. The pattern of a rectangular patch antenna is rather broad with a maximum direction normal to the plane of the antenna. Circular polarisation may be achieved by feeding adjacent orthogonal edges of a square patch 90° out-of-phase, as implemented in this antenna.